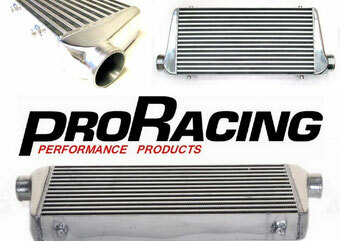 PRO Racing Intercoolers and Alloy Intercooler Piping. PRO Racing Front Mount Intercoolers feature Bar and Plate construction that is designed to deliver maximum cooling efficiency while minimizing pressure drop. Obviously different size engines require different size Intercoolers to get maximum results, the 3 sizes below cover the majority of these requirements, please let us know what your needs are and we can help choice the correct Front Mount Intercooler for you. Also available is a range of Alloy Intercooler Piping in Straights, 45 Degree, 90 Degree & 180 Degree, this LINK will take you to that page.